In On learning InnoDB: A journey to the core I introduced a new library and command-line tool in the innodb_ruby project. Now I’ll show off a few of the things it can do. I won’t try to explain all of the InnoDB structures exposed, since that will get the demos here way off track. We’ll come back to those structures later on! This should generate a table of 1 million rows (inserted in random order to make things more interesting), of about 48MiB, or 3,071 16KiB pages. Without getting into too many of the InnoDB internal implementation details, you see some of InnoDB’s bookkeeping structures (FSP_HDR, IBUF_BITMAP, and INODE pages), actual table data (INDEX pages), and free space (FREE (ALLOCATED) pages). The page-dump mode dumps everything it knows about a single page. It currently leans heavily on the typical Ruby pretty-printer module pp to print the structures — that would be a great thing to clean up in the future. The innodb_ruby library initially parses pages using a minimal Innodb::Page class, and then using the type field present in the common header optionally hands off the different page types to specialized classes (such as Innodb::Page::Index for type INDEX) for further parsing. The FIL header (and footer) is common to all page types and contains primarily information about the page itself. a summary of sizes (in bytes) of different parts of the page: free space, data space, record size, etc. This allows you to see the amount of data and free space, and a record count for the table with a minimal fuss. 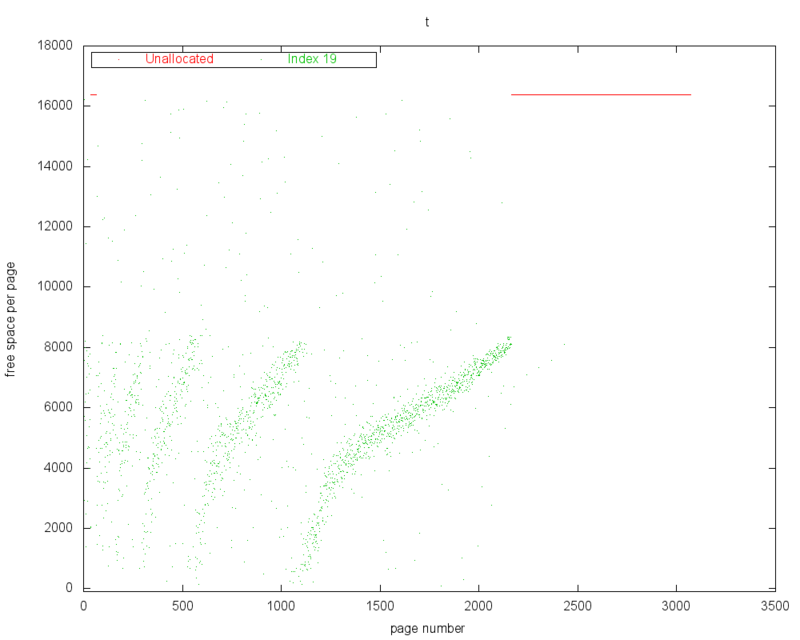 Free Space Plot – The Y axis indicates the amount of free space in each page, while the X axis is the page number, and represents file offset as well. Click for a full-size version. Enable record parsing and dumping in page-dump mode. This will cause :key and :row keys to be populated in the records dumped, as well as make the transaction ID and roll pointer keys available (they are stored in-between the key and non-key fields, so are not reachable without knowing how to parse at least the key fields). Allow use of all index recursion functions, including the index-recurse mode. The ability to parse records is required in order to parse InnoDB’s internal B+tree “node pointer records” which link the B+tree pages together. Some sample page dumps with full records printed are available: test_t_page_3_page_dump.txt (the index root page) and test_t_page_4_page_dump.txt (an index leaf page). This will actually walk the B+tree in ascending order (basically a full-table scan) while printing out some information about each node (page) encountered and dumping user records on leaf pages. A larger sample (10k lines) of its output is available here: test_t_page_3_index_recurse.txt. I hope this has been a useful first introduction. There is a lot more to come in the future. Patches, comments, and advice are very welcome! Update 1: Davi pointed out several typos and errors which have been corrected. ;) Make sure you’re using the newest code from examples above. Posted on January 3, 2013 by Jeremy Cole. This entry was posted in InnoDB, MySQL. Bookmark the permalink. This tool is very helpful. I was developing similar tool in C++. Definitely, I don’t need to develop anymore. Thank you for providing this tool. and I dont know why my first page in ibdata1 file having pagetype 0, I comment out the check ” unless page_offset == 0 && Innodb::Page::PAGE_TYPE[page_type] == :FSP_HDR”, but still get no luck….. The error you have there is in the command-line arguments. You should remove the “-” before “space-page-type-regions”. Thanks for your response and I think I mis-pasted the result. You definitely don’t want to comment out the check; it’s there for a reason. :) Was the file created on 5.0, or some earlier version? Is there anything weird about your configuration? The file was created on 5.0.77 and do I have to use later version? I guess the 5.0.77 version is too old and data structure might be little bit different which cause your ruby program got parsing problem. Maybe ,1 million inserts should put into one transaction.If not,it will be very slow because of busy io.